Ahoy! We last left off on the first half of our Embarkation Day on our Disney Fantasy Honeymoon Cruise, which you can check out here. 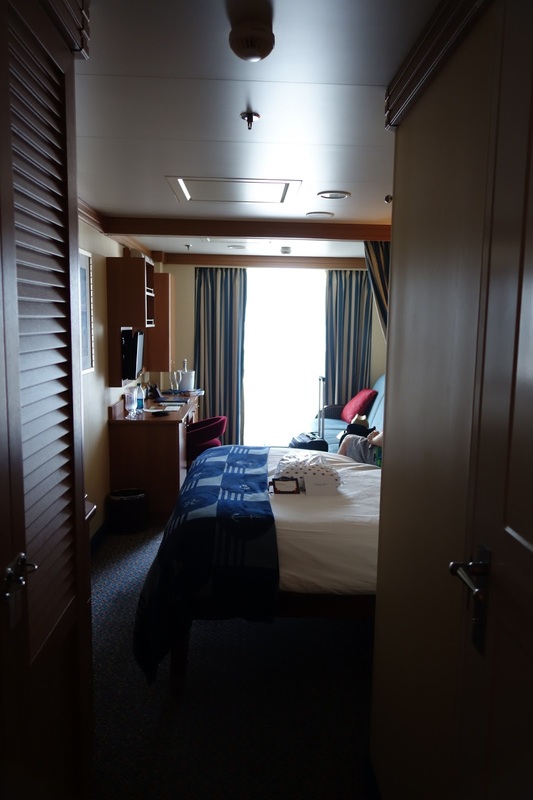 After exploring the ship a bit more, we decided to take a chance and see if our state room was ready. Lo and behold, it was! This was around 1:30 pm. I know I've already spoken about how great Tammy at Storybook Destinations was in helping us book our trip. 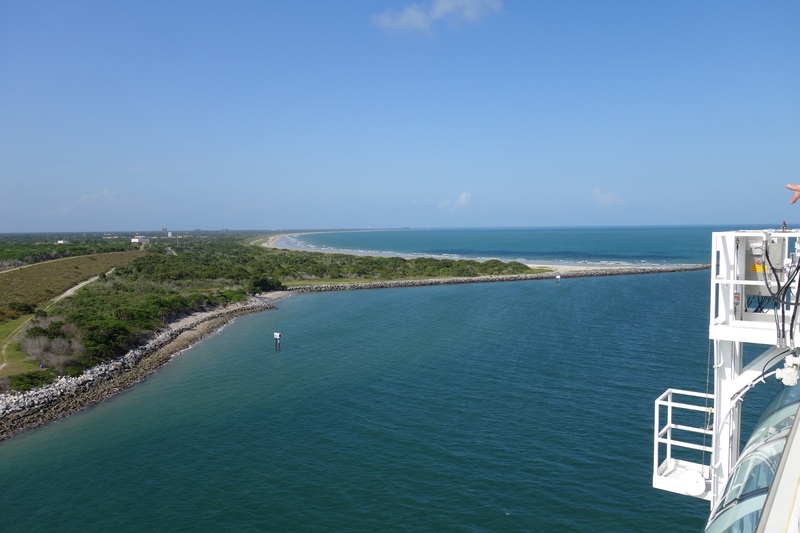 Our state room sealed the deal with how helpful it is to have a knowledgeable agent assist with booking. 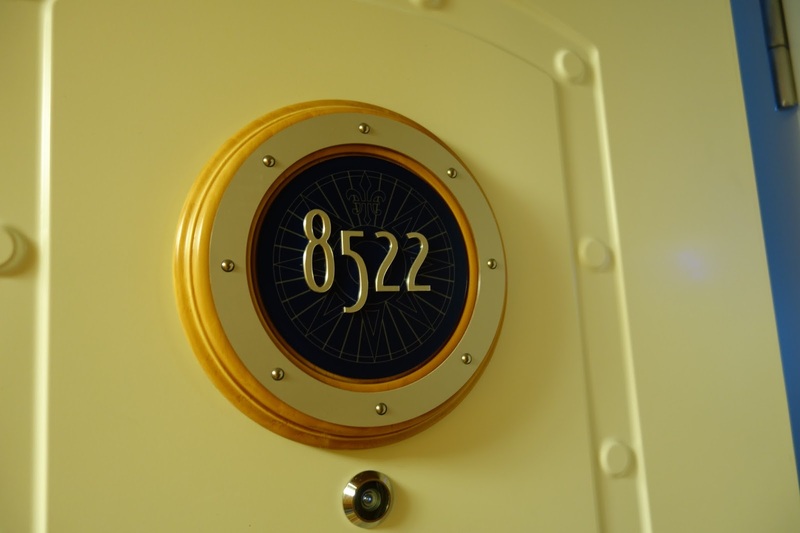 She recommended the location of our state room, on the starboard side of the ship. She also suggested we try to get as close to the front as possible, to help reduce movement and engine noise. After doing plenty of research on my own regarding state rooms, her suggestions seemed sound, so we booked this specific room. It couldn't have been better. 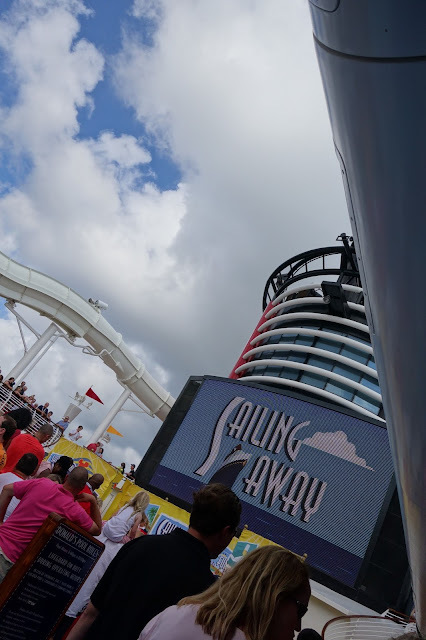 Since it's located at the front of the ship, the elevator bank we used deposited us literally right into the adult-only pool. 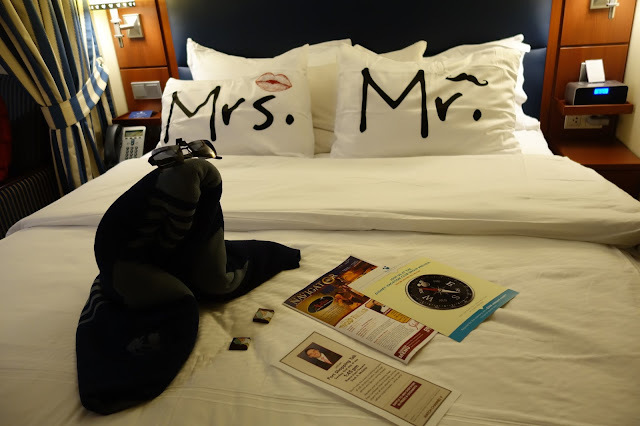 It was a quick two minute trip back to our room to refresh our drinks, grab a magazine, etc. The views pulling into the various ports were lovely from this side of the ship, and we didn't have a lot of traffic in the hallway because we were so close to the front. I'd recommend it 100% and would book the same location again. Tammy also included this adorable Mickey top hat door magnet in her welcome packet. 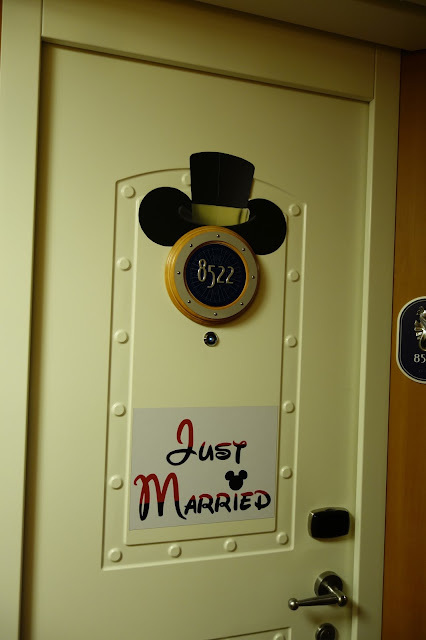 We found the 'Just Married' magnet online. 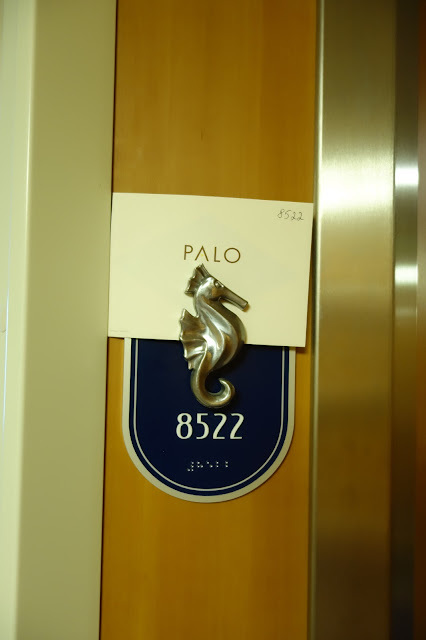 We had dinner reservations for Palo that evening; our reservation reminder was tucked next to our door. 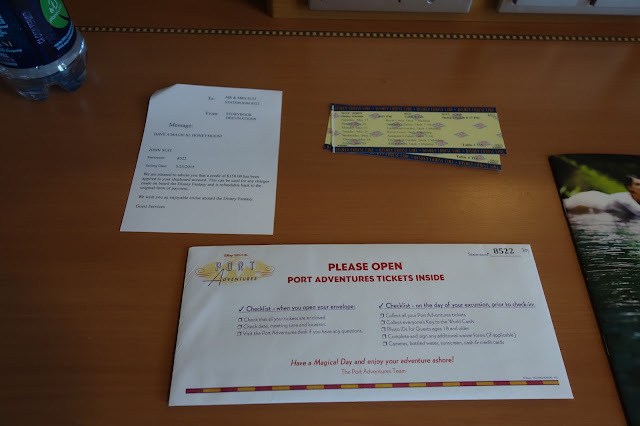 Port adventure tickets and more were already in our room. 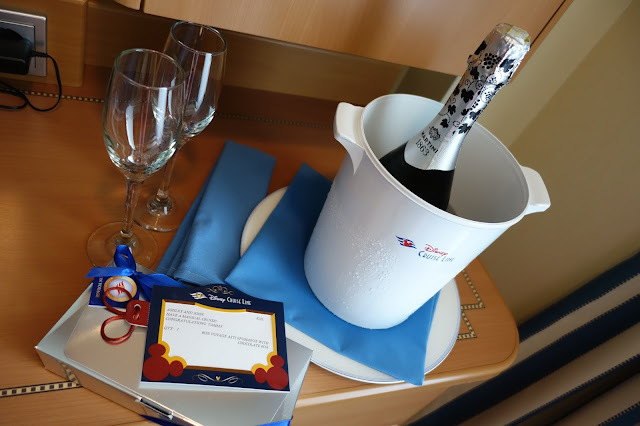 Tammy even went as far as to have a plush DCL robe and champagne and chocolates in the room upon our arrival. Boy, did we feel spoiled. Could this cruise start off any better?? Thank you, Tammy! 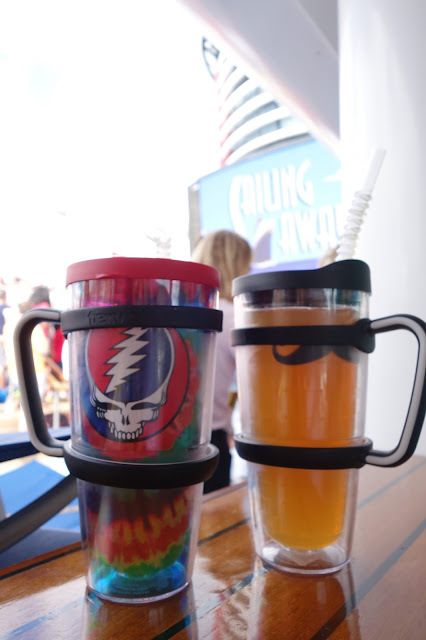 We filled our Tervis Tumblers with some adult libations and headed up to check out the Sail Away party. This particular concoction was sweet tea vodka, lemonade and iced tea from the (unlimited! free!) soda machine. 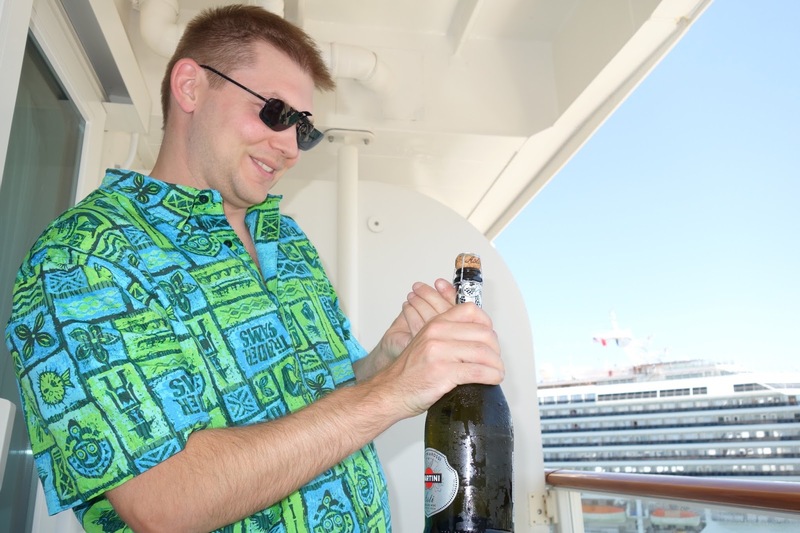 It is stated not to drink your carry-on booze around the boat; I feel as long as you stay respectful and discreet, enjoy yourself. 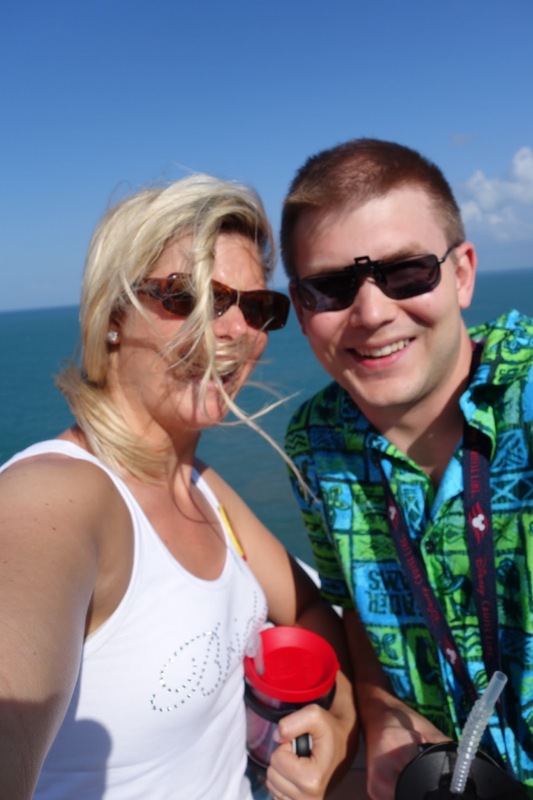 It was crazy windy as we headed out of port. We headed back to our room to allow plenty of time to dress for dinner. 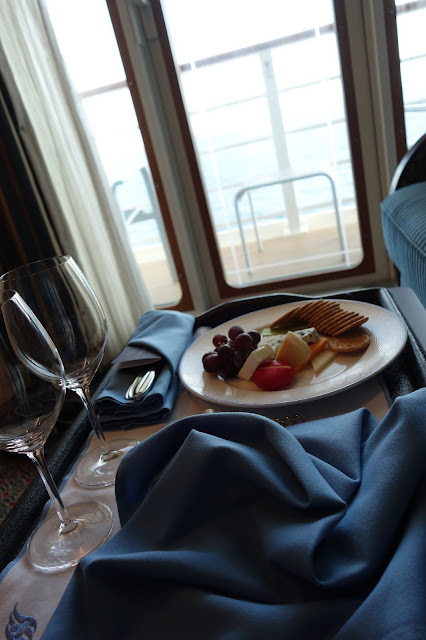 We ordered a cheese plate from room service (complimentary!) 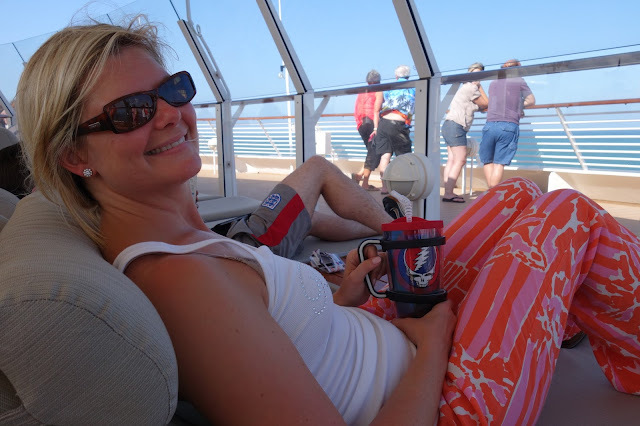 and enjoyed it on the veranda with some wine we carried on board. We made our way to Palo and enjoyed a nice, quiet dinner-- the perfect way to kick off our Honeymoon cruise. Of course, we ordered the infamous chocolate souffle at the end of our meal. 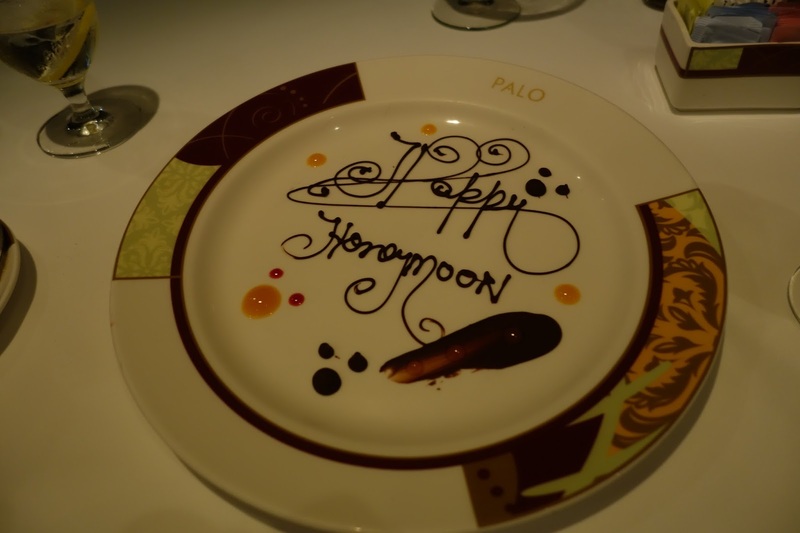 They also brought out a little 'dessert plate' with a sweet message written in chocolate. Palo was good- very good actually, and considering it only costs an additional $25 per person (yes, on top of what you've already paid for the cruise, but still, you'd pay that for a typical meal at TGI Fridays) it was well worth the price. 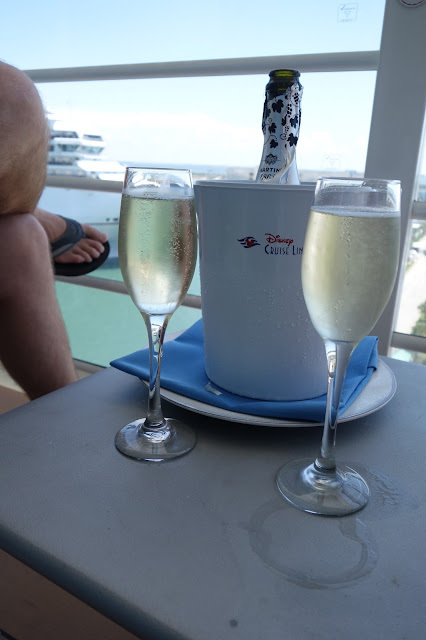 I'd probably do it again on a cruise longer than three nights, just to get a break from the crazy main dining rooms, but we enjoyed Palo brunch MUCH more. More on that in a later post. 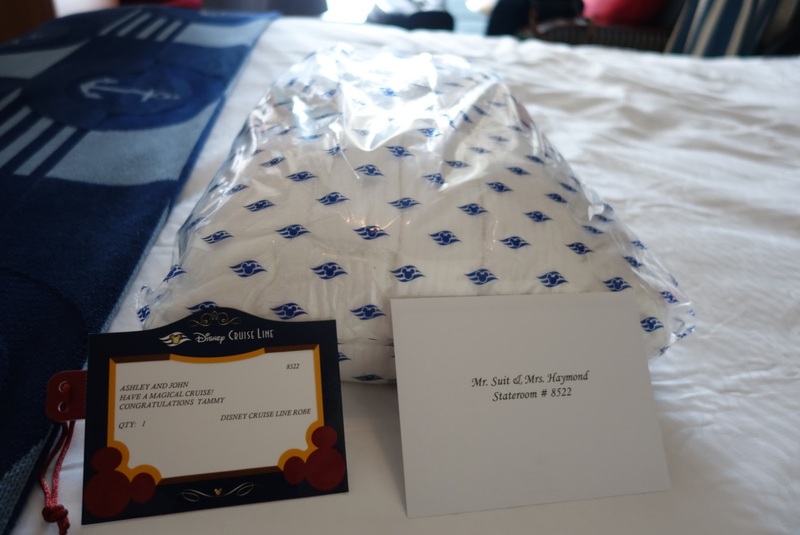 We returned to our room and found our first towel animal of the trip. I brought these pillowcases from home. It was a great first day, and it was only just the beginning of what would be one of the best trips we've ever had! * Booking a stateroom in the front of the ship helps reduce movement, reduces foot traffic in the hallway in front of your room, and is the most convenient for accessing the adult-only areas. Starboard side provides beautiful views when pulling into ports and Castaway Cay. * Staterooms on the higher decks (9 and 10) can be prone to noise from above, as the activity decks, shuffleboard, and more are right above them. The lower you go, the more movement you may feel. 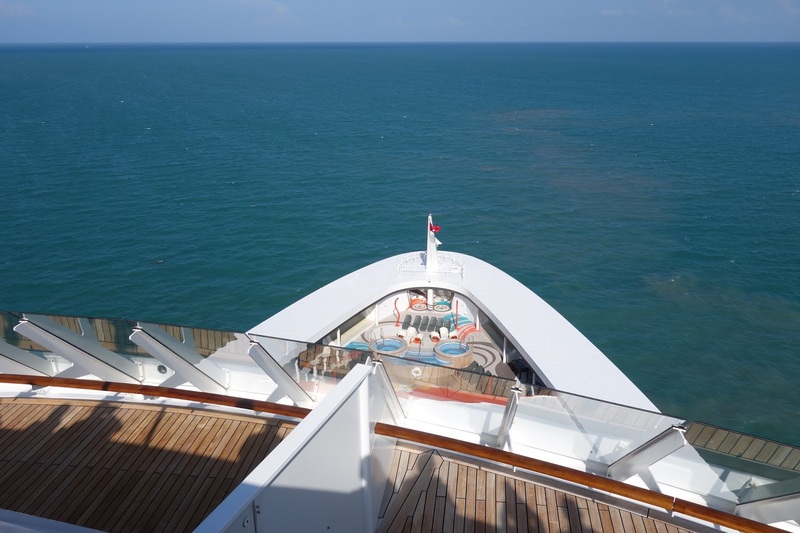 Deck 8 was just right for being up high enough, but not too high to be a far elevator (or stairway) trip away from almost anything. *Your stateroom attendant should check on you fairly soon after entering your room. Don't be shy about introducing yourself and asking for anything you may need to make your stay more comfortable. Our attendant, Rosello, was the bees knees. We asked for extra hangers, some ice, and a few wine glasses and corkscrew upon arrival. He promptly returned with everything. We gave him a generous cash tip on the spot for his service, and to keep us in his good graces. ;) He took great care of us the rest of the trip. * We loved having our Tervis Tumblers for toting around the ship. Apparently, sunscreen can permanently damage the finish on them, so we opted to get the handles. Lids are a must to prevent spills while walking around. *Sodas, lemonade and iced tea are complementary and are located in the fountain machine on either side of the main pool. *If you're booking dinners at Palo or Remy and want to time it to catch the sunset, be sure to check the Navigators to get an idea of what time the sun goes down each night. These can be found with a quick Google search. Many are also found here. 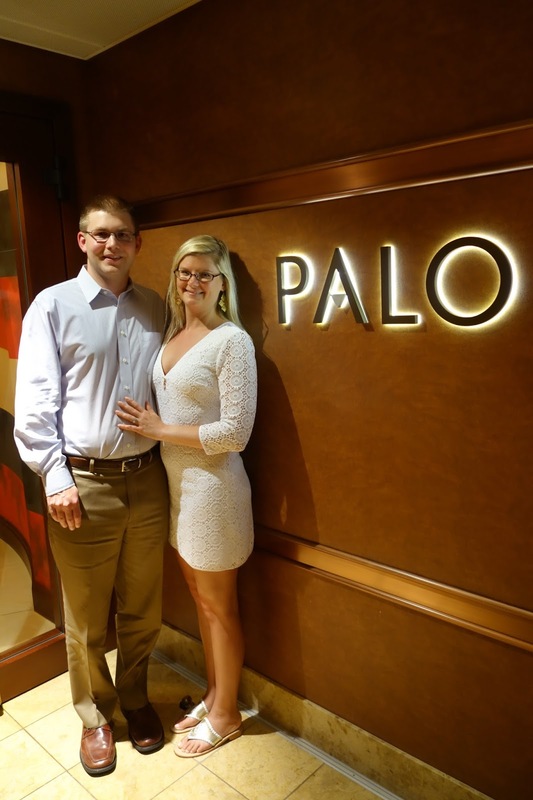 * We opted to dine at Palo our first night to give us a relaxed, romantic start to the cruise. Again, this is one of many ways that a Disney cruise can be very adult-friendly, if you know how to schedule and plan. 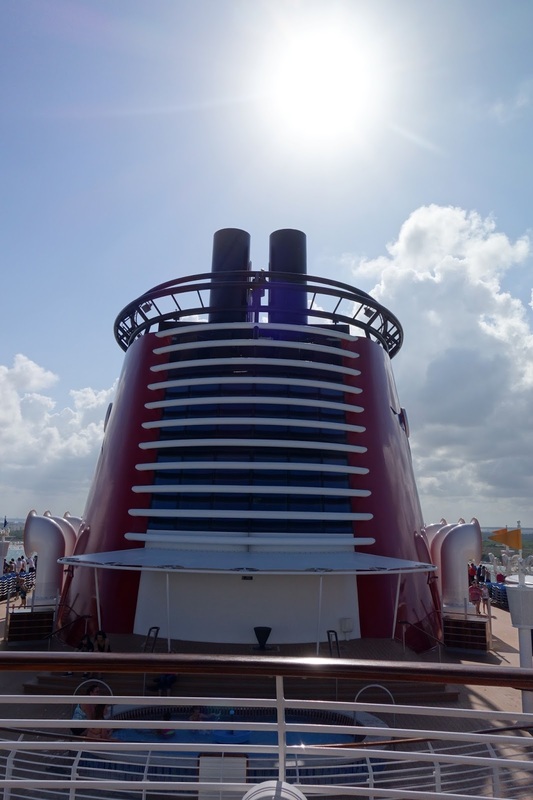 Cruise envy! I've never been on one, but you make it look so fun!